Can be made in 'sport' sound which is approx 5db louder than standard or in 'Race' sound which is approx 9db louder. We will get the item to you as quickly as possible. For E92 / E93 coupe / convertible 330i only. Can be made in 'sport' sound which is approx 5db louder than standard or in 'Race' sound which is approx 9db louder. We will get the item to you as quickly as possible. Can be made in 'sport' sound which is approx 5db louder than standard or in 'Race' sound which is approx 9db louder. We will get the item to you as quickly as possible. We can not send this item to either Cyprus or Malta. For E92,E93 coupe, convertible models. so no need to wait for manufacture. We will get the item to you as quickly as possible. The rear sections be made in 'sport' sound which is approx 5db louder than standard or in 'Race' sound which is approx 9db louder. We will get the item to you as quickly as possible. 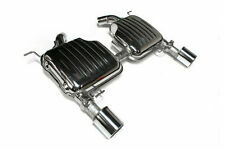 Eisenmann performance downpipes are also available for £1095 extra. For F80 M3 & F82 F84 M4 models. Resonated centre section is available for extra £200. The rear silencer can be made in 'sport' sound which is approx 5db louder than standard or in 'Race' sound which is approx 9db louder. 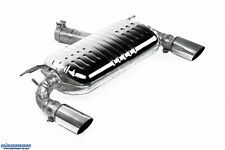 EISENMANN Duplex sports exhaust Audi S4 type B8 3.0 l TSFi Quattro re / li each 2x83mm. 3.0 l TSFi (245kW). Audi S4 Type B8 Quattro from year 2007. Audi A4 (8K2, B8) 11.08 - 12.15 S4 quattro 2995 333 (245). EISENMANN stainless steel sport exhaust BMW F34 325d 330d incl. XDrive single-sided 2x76mm. 325d (160kW). 330d (190kW). BMW F34 Gran Turismo incl. BMW 3 GRAN TURISMO (F34) 03.13 - 325 d 1995 218 (160). Eisenmann Sportauspuff D7216.00831. Eisenmann sport rear silencer exhaust. Increasingly stringent noise regulations and emission regulations require flexibility and experience in exhaust technology. No problem! EISENMANN rear exhaust silencer Mini Cooper S type R56 R57 in the middle 2x83mm. Eisenmann sport rear silencer exhaust. Increasingly stringent noise regulations and emission regulations require flexibility and experience in exhaust technology. EISENMANN stainless steel sport exhaust rear silencer BMW 5er F10 520i left 2x83mm. 520i (135kW). Tailpipe: left 2x83mmround rolled angle. BMW 5 Series F10 from year 2011. Eisenmann sport rear silencer exhaust. Can only be used in conjunction with Eisenmann rear silencer! BMW 3 (E46) 09.00 - 02.05 325 i 2494 192 (141). BMW 3 (E46) 09.00 - 02.05 320 i 2171 170 (125). BMW 3 (E46) 06.00 - 02.05 330 i 2979 231 (170). EISENMANN stainless steel Duplex sport exhaust BMW 1er F20 F21 116i LCI each 2x / 2x76mm. 116i (80kW). BMW 1 Series F20 F21 from year 01/2005. BMW 1 (F21) 03.15 - 116 i 1499 109 (80). BMW 1 (F20) 03.15 - 116 i 1499 109 (80). Eisenmann Sportauspuff B5213.00760. EISENMANN sport exhaust BMW Z3 2 x 76. Eisenmann sport rear silencer exhaust. Increasingly stringent noise regulations and emission regulations require flexibility and experience in exhaust technology. EISENMANN Stainless Steel Sport Exhaust Middle Silencer Skoda Octavia 5E 2.0 TSI RS. Skoda Octavia 5E from year 2012. SKODA OCTAVIA (5E3) 05.13 - 2.0 TSI RS 1984 220 (162). SKODA OCTAVIA (5E3) 05.15 - 2.0 TSI RS 1984 230 (169). EISENMANN duplex sports muffler silencer. Manufacturer: Iron man. BMW 2 F22 F23 coupe convertible. Sport exhaust direct. - Made of high quality stainless steel. The flow technology, pipe sizing and damping of aEisenmann sport exhaust ensures optimum engine performance, torque and rich sound in all driving situations. 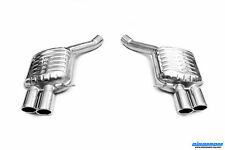 EISENMANN stainless steel Duplex sport exhaust BMW 5er F10 F11 528i re / li each 2x83mm. BMW 5 Series F10 Sedan F11 Touring from year 2011. BMW 5 Touring (F11) 09.11 - 528 i xDrive 1997 245 (180). BMW 5 Touring (F11) 09.11 - 528 i 1997 245 (180). 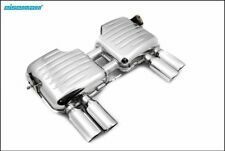 EISENMANN Exhaust muffler stainless steel BMW Mini One Convertible and Mini Cooper Convertible - centered 2 x 70mm beveled polished. Eisenmann sport rear silencer exhaust. Increasingly stringent noise regulations and emission regulations require flexibility and experience in exhaust technology. 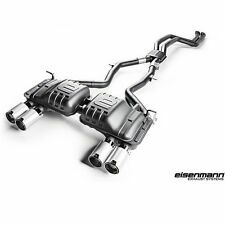 EISENMANN sport exhaust BMW 3er E46 320i 325i 330i 330ci 2x70mm 325ci 320ci. 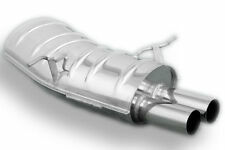 EISENMANN sport exhaust stainless steel muffler. 320i / 320ci (125 kW). Increasingly stringent noise regulations and emission regulations require flexibility and experience in exhaust technology. 116i (80kW). BMW 1 Series F20 F21 from year 01/2005. BMW 1 (F21) 03.15 - 116 i 1499 109 (80). BMW 1 (F20) 03.15 - 116 i 1499 109 (80). Eisenmann sport rear silencer exhaust. The flow technology, pipe sizing and damping of aEisenmann sport exhaust ensures optimum engine performance, torque and rich sound in all driving situations. Increasingly stringent noise regulations and emission regulations require flexibility and experience in exhaust technology. BMW 5 series G30 G31 touring sedan. BMW 5 touring (G31) 07.17- 530 i xDrive 1998 252 (185). Iron Stainless Steel Exhaust Pipe BMW F34 325d 330d Incl. Xd Rive Single Sided. 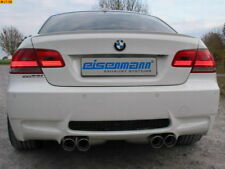 EISENMANN stainless steel sport exhaust BMW F34 325d 330d incl. XDrive single-sided 2x76mm. 325d (160kW). 330d (190kW). EISENMANN sports exhaust Seat Leon 5F SC 1.8 TSI one side 2x76mm black. Eisenmann sport rear silencer exhaust. Increasingly stringent noise regulations and emission regulations require flexibility and experience in exhaust technology. 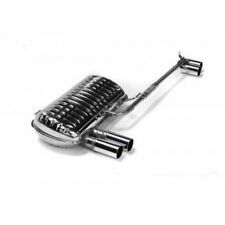 EISENMANN sport exhaust duplex silencer BMW E36 320i 323i 2 x 70 mm. EISENMANN Exhaust Duplex rear silencer. 320i (110 kW). (Not for diesel.). 323i (125 kW). BMW 3 (E36) 09.90 - 02.98 320 i 1991 150 (110). EISENMANN RACE duplex sport exhaust BMW q87 M2 competition per 2x90mm carbon optics. EISENMANN RACE duplex sports muffler silencer. M2 competition (302kW). BMW 2 Coupe (F22, q87) 06.18- M2 competition 2979 411 (302). Eisenmann Sportauspuff B5247.00760. 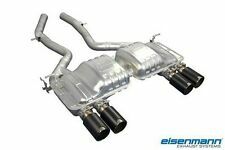 EISENMANN sport exhaust BMW E46 318 d - 320 d 2 x 76. Eisenmann sport rear silencer exhaust. Increasingly stringent noise regulations and emission regulations require flexibility and experience in exhaust technology.